The unique climate and steep slopes of the Leelanau Peninsula are the perfect combination for producing some of the country's best wines. Within the towns of Leland, Northport, Suttons Bay and Glen Arbor you can visit close to 20 wineries. The architecture varies as much as the wineries themselves--you'll find everything from old farmhouses to modern buildings to stately mansions. For more information, visit the Leelanau Peninsula Vintners Association website. Traverse City is known as the "Cherry Capital of the World" and many of the wines produced here use this fruit flavor. White wines, such as Rieslings and Chardonnays first made their mark here, but now Traverse City wineries have branched out into making light reds like Merlot and Pinot Grigio. There are roughly a dozen wineries in Traverse City and Old Mission Peninsula. For more information, visit the Wineries of Old Mission website. Throughout the year, many Northwest Michigan wineries offer special events, such as Wine & Art Festivals, Annual Vineyard Run & Walk, Holiday Wine & Food Celebration and Spring Sip & Savor. 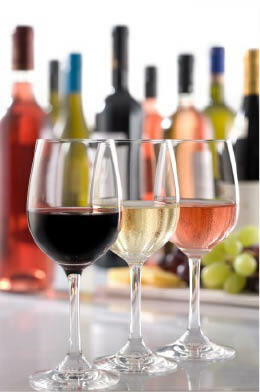 Vintners from Northern Michigan wineries invite you to wine tastings...call for times. Or grab a group of friends and let someone else do the driving! Wine Tasting Tours are available to shuttle you in comfort and style, while you enjoy the beautiful countryside that surrounds area vineyards.